Since most visitors come to Zion in the summer months, it may be hard to imagine this red-rock wonderland covered in snow. 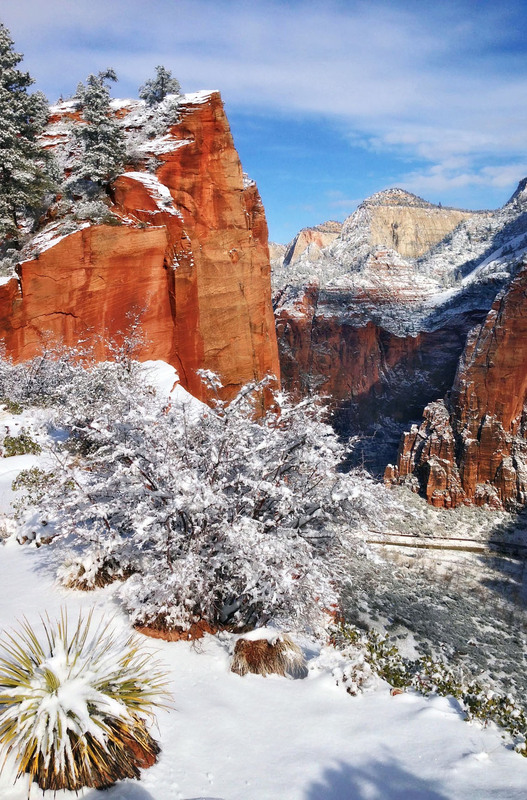 Although freezing temperatures are rare and don’t usually last more than a few days, it is possible to see places like the Great White Throne and Angel’s Landing decked-out in winter white. Winter fog at Court of the Patriarchs. More frequently, winter scenes at Zion consist of a dusting of snow at the tops of the 7,000′ – 8000′ peeks, with fog rolling up the hillsides to lend an additional sense of mystery and awe to a landscape which is already beautiful beyond words. Crowds are gone, leaving the wildlife to enjoy their surroundings without being disturbed. Mule deer roam the river-bottoms, and seem content to stay-put rather than venture away from food and running water. For those who can’t make the trip this winter, enjoy the photos and visit soon!